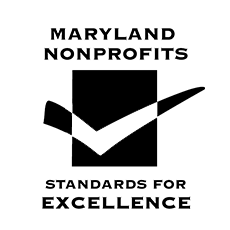 The Arc Baltimore has always taken seriously the task of providing continuing education and training to its staff, and we’ve done it again. Recognizing that The Arc was welcoming increasing numbers of individuals with autism who were transitioning from school or another program, Dawn Davis-Brodeur, director of training, and Heather Rivera, psychology associate, started an autism training program! Justice Smallwood (left), who also took the autism training, shown with Brian Cassano (center) and Randyn Smallwood. Randyn helped train Justice and eased him into Brian’s support plan. Here, the trio takes a break after playing soccer at Hannah More Park, one of Brian’s favorite places to spend time. The training lasts four months; two-hour classes are held every other week. There is a homework assignment for each class, and—as a final project—trainees must develop an individualized support plan that is presented before a panel of senior staff. Participants must pass a comprehensive exam as well. Training covers how to develop and implement visual schedules and routines. In addition, it focuses on sensory processing, assistive technology and environmental adaptation. For extra credit, several of the staff attended a conference at which Temple Grandin, who has autism, spoke. An American professor of animal science at Colorado State University, Grandin is a world-renowned autism spokesperson. Brian, Randyn and Justice enjoy playing sports and jogging together at the park. Davis-Brodeur adds, “Randyn came in hungry for knowledge from day one. He was passionate about working with Brian, and he discovered how helpful it was to develop a schedule for the young man. He was always willing to share, and he had the spirit to learn. He thrived on connecting with Brian and enhancing his already existing gifts. Randyn has since become a resource to other staff supporting individuals with autism. Sign up today to get The Arc Baltimore's latest news and events.